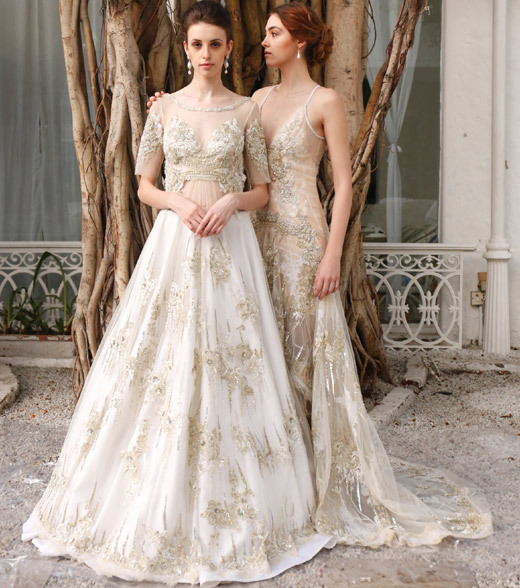 Soltee by Sulakshana Monga brings out a fresh range of dainty gowns for the perfect summer look. The collection includes muted and neutral colours with fabrics used are jute, cotton, net, silk and chiffons with surface ornamentation and sequin highlights along with hand and machine embroideries. The dresses are unraveled and has unfinished look towards it, intricate handwork has been done in a way to create a poetic impression in the looks also the silhouettes have been inspired from history and deconstructed in a humble fashion, controlled drapes and fluid garments will make an impression. blends the thread of traditionalism and modernity with the perfect combination of style, intricacy and opulence. The collection is exclusively designed keeping in mind the irresistible combination of colors, styles and designs which are definitely eye catching. Soltee from the soul of Sulakshana Monga are manufacturers of high define quality garments. The company was formed 21 years ago and comprises the team of professionals with extensive and proven experience in garment designing and manufacturing. Soltee specializes in manufacturing of ladies hi-fashion garments, Indian, Indo-Western, with varied world wide client bank and with its own edgy design team who are able to stay at the forefront of fashion. Soltee has enjoyed exponential growth since its launch with a cover area of over 20,000sq.feet; It has a wide space and know how to complete orders with the customer's required time constraint, thus giving them the fast fashion advantage they’re constantly seeking. Address- Soltee, One Style Mile, 6-8, Kalka Das Marg, Mehrauli, New Delhi.